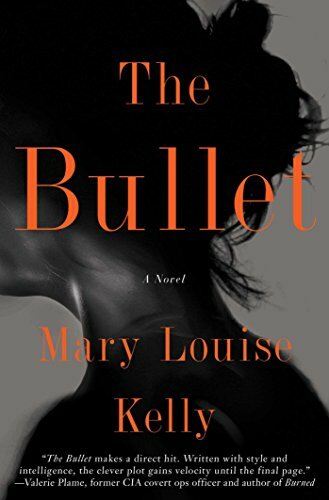 As a frequent NPR listener, I was intrigued when I saw that correspondent and household name Mary Louise Kelly had written a novel. I was even more intrigued when I heard about the premise: a thirty-seven-year-old woman undergoes an MRI that reveals a bullet lodged in her neck—and she has no idea how it got there. What?! Sign me up, right? It turns out that Caroline, a French professor at Georgetown, isn't who she thought she was. When confronted with the doctors' strange discovery, her parents confess they adopted her at age three. Her birth parents were murdered, the case never solved. Caroline was hurt in the attack and almost died herself. Her adoptive parents never knew a bullet was still in her neck, waiting to one day reveal the secret of their daughter's identity. Needless to say, Caroline's entire world is rocked by this revelation. What follows is her dogged pursuit of her parents' killer. It becomes increasingly clear that she will stop at nothing in her quest for justice. At the beginning of the book, Caroline is so self-assured she borders on cocky; as her hunt progresses, her self-righteousness balloons until she can justify (to herself, at least) even the craziest of actions. I'm not entirely sure whether or how much I was supposed to like Caroline. Quite frankly, even at the beginning I found her to be a vain, pretentious ego-monster. (Maybe it was all the French. Or the self-satisfied way she describes her own appearance, claiming she has a better rack than Salma Hayek. Right, and I have the wiry, muscled frame of a young Mary Lou Retton.) Thus in the second half of the book, I found it hard to root for her or understand her choices. Still, the action was relentless, and I have no problem reading about unlikeable characters, so I was hooked to the end. Despite its obnoxious protagonist, The Bullet gets points for being a solid thriller with an irresistible premise. With regards to Gallery, Threshold, Pocket Books and Netgalley for the advance copy. On sale March 17.